Forward head posture, rounded shoulders, a hunched upper back, headache, shoulder pain, upper back and neck pain and tension. These are the symptoms of upper crossed syndrome. Upper crossed syndrome is a common postural abnormality resulting in a weakening and lengthening of the back of the body’s upper back and neck muscles and a tightening and shortening of the opposing front of the body’s chest and neck muscles; hence the name upper crossed syndrome. Upper crossed syndrome involves what is called “reciprocal inhibition”, a process where muscles on one side of a joint are relaxing to accommodate contraction on the other side of that joint. Specifically there is tightness of the upper trapezius, pectoralis major, and levator scapulae and weakness of the rhomboids, serratus anterior, middle and lower trapezius, and the deep neck flexors. This pattern of imbalance creates joint dysfunction, particularly at the atlanto-occipital joint, C4-C5 segment, cervicothoracic joint, glenohumeral joint, and T4-T5 segment. These postural changes decrease glenohumeral stability as the glenoid fossa (the shallow depression on the scapula bone that the head of the humerus fits into) becomes more vertical due to serratus anterior weakness leading to abduction, rotation, and winging of the scapulae. This creates a loss of stability and this loss of stability requires the levator scapula and upper trapezius to increase activation to maintain the arm position in the shoulder joint. There is also increased and constant activity of the supraspinatus, causing degeneration of the muscle. As a result of these weakened muscles, postural deformity and degeneration is rapidly accelerated to the, ultimately affecting the discs and will lead to pain and dysfunction. 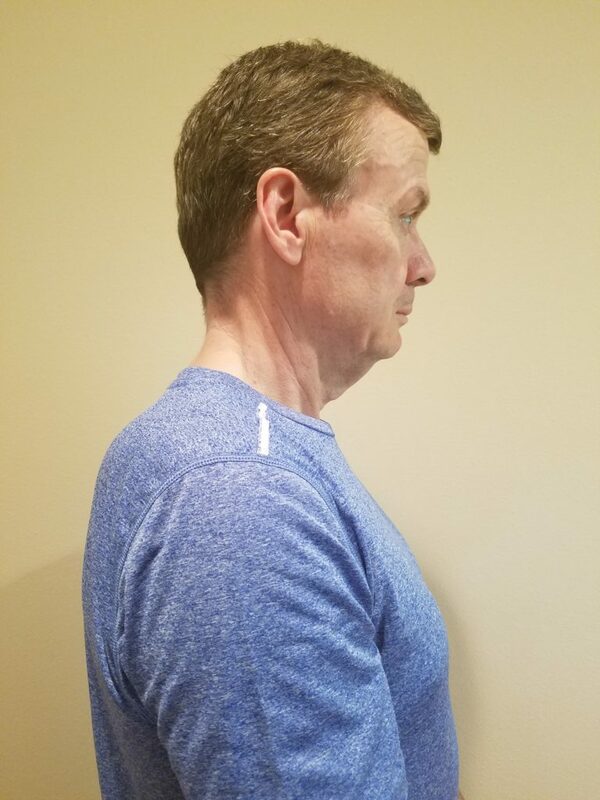 Upper crossed syndrome is typically promoted with a sedentary lifestyle sitting with bad posture, biking with a rounded upper back position, and/or imbalanced strength training such as a person who trains his chest while the back is rarely trained. All these can initiate upper crossed syndrome and in a vicious cycle, this muscle imbalance pattern worsens posture and exercise technique further. Correcting upper crossed syndrome is complex. In this article, I will focus on strengthening the deep neck flexor muscles that support the head. The deep neck flexors are the first muscles to weaken in forward head posture. 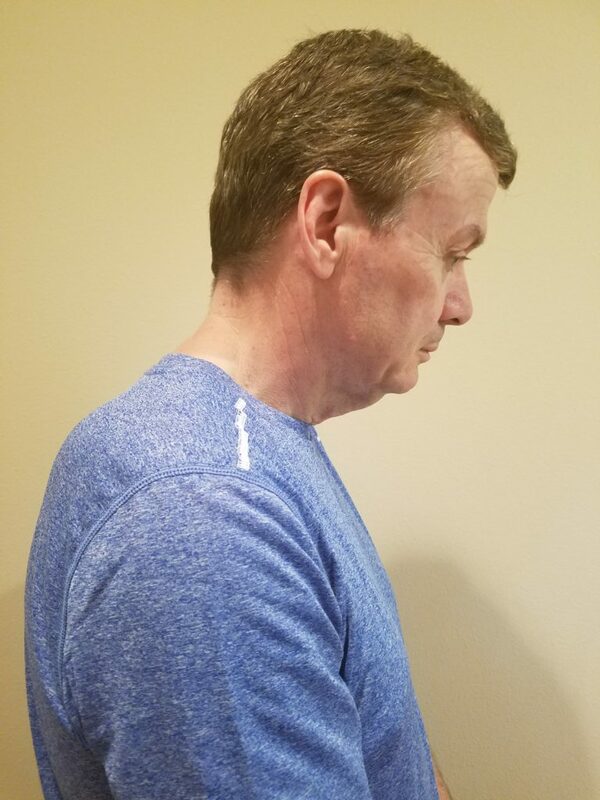 The front deep neck flexor muscles called the longus capitis and longus colli attach to the front neck vertebrae and are the important stabilizers responsible for holding the head up and maintaining good head posture. When these muscles become weak from forward head posture these muscles eventually fatigue and cause other muscles behind the skull, the sternocleidomastoid, subocciptial, upper trapezius as well as the other posterior muscles of the neck to become stretched as a result of these muscles trying to compensate from the significant weakness and imbalance from these deep neck flexor muscles. (“reciprocal inhibition”, a process where muscles on one side of a joint are relaxing to accommodate contraction on the other side of that joint). Forward head posture leads to inflammation, dysfunction, degeneration and pain and is a serious issue. The head weighs twelve pounds. Forward head posture, adds an additional twelve pounds for every inch going forward and weakens these neck muscles. Every inch that the head goes forward adds an addition twelve pounds. Two inches forward makes the head weight thirty six pounds, three inches forward makes the head weigh forty two pounds. If you add up the hours, days and years of keeping the head in this position, this puts a tremendous load against gravity causing significant degeneration, arthritis, herniated discs, pinched nerves or spondylosis. These conditions cause rapid degeneration of the neck leading to inflammation, dysfunction, degeneration and pain. It is essential to correct these muscle imbalance patterns, as they lead to poor exercise technique, compensation patterns, pain and injuries. Upper crossed syndrome is a complex issue. Here I address how I initially assist a client with their corrections by focusing on strengthening the deep neck flexors. One of the most effective postural exercises for strengthening the deep neck flexors is the chin tuck exercise. Start slowly with one set of 12 daily. If at any time you feel soreness or increased pain, take a day off to rest. Severe pain warrants a call to your doctor or physical therapist. Stand or sit and look straight ahead. Pull your shoulders down and back by thinking about sticking your shoulder blades in your back pockets. Lift your head as if it is being pulled upward by a string. Tuck chin straight back as if to make a double chin, keeping chin parallel to the ground. Keep head lifted up and back. Hold this 5 seconds then slowly release the tension. You should feel a pull in your suboccipital muscles in the top back of your neck. You should feel your front neck muscles contract if you place your fingers on them. You are stretching the suboccipital and strengthening the deep neck flexor muscles. Do this twelve times. You may do this three times a day. After several weeks, when you feel you have mastered exercise #1, move to #2. Wrap a small towel behind your head at the base of your hairline. Hold the towel endings in each hand. 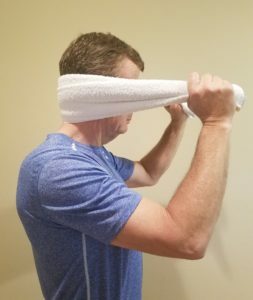 Hold the towel tightly to create resistance for the neck. Assume the same position as in Exercise #1 Chin Tucks and press against the towel. Caution: Keep in mind that most trainers are not trained to deal with these issues. If you have upper crossed syndrome or other postural deviations, be cautious with the exercises that you choose to do or those that a personal trainer might have you perform. For instance, do not do neck plate curls or exercises using a neck harness as these can cause damage. When choosing a personal trainer, look for one with advanced certifications such as Advanced Health and Fitness Specialist or Medical Exercise Specialist. Only those personal trainers with a four-year degree in exercise science and those that have over 300 hours of personal training experience are eligible to take the exam for these certifications. Training of individuals with upper crossed syndrome requires someone with in-depth knowledge of the appropriate type of activity that will most benefit them, taking their limitations into consideration.